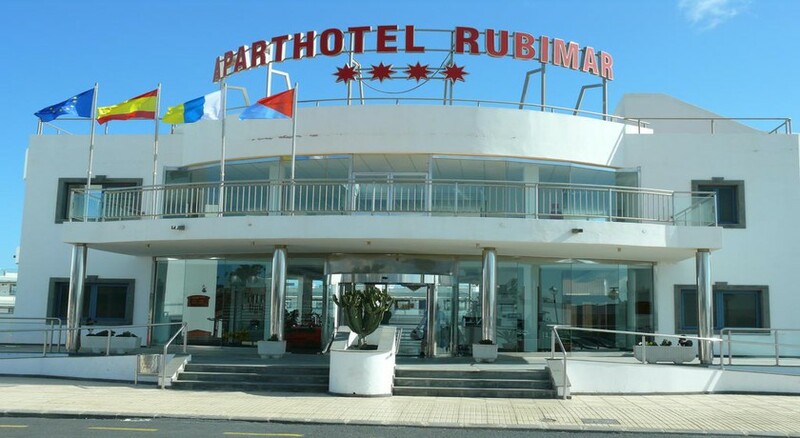 In sunny Playa Blanca, not far away from sandy beaches is the Rubimar Suite ApartHotel, one of the best 4-star family hotels in the area. Comfortable accommodation, warm hospitality and competitive prices are some of the features that stand out in favour of this hotel. The hotel is next to the Marina Rubicón and close to the Playa Dorada beach. The magnificent beaches of Playa Blanca and Papagayo are also a short distance away. The spacious apartments feature all modern amenities for a comfortable stay. The hotel also offers indoor and outdoor pool, pool bar, Jacuzzi, sports facilities and entertainment. With easy access to cafés, restaurants, markets and shops, the Rubimar Suite ApartHotel is undoubtedly your best bet, when it comes to enjoying Playa Blanca on a limited budget. Rubimar Suite ApartHotel is a beach resort located just 2km from Marina Rubicon and its lovely promenade. Away from the hustle and bustle of the town of Playa Blanca, the hotel is an oasis of peace and calm. The lovely beach of Playa Blanca is 2.1km from the property. The Lanzarote Airport is the nearest airport, which is at a distance of 29.5 km. Arrecife, a large city, is about 35km from the hotel. Rubimar Suite ApartHotel has spacious, recently renovated, well-appointed apartments with modern furnishings. The apartments come in One-Bedroom Apartment and Two-Bedroom Apartment. These come with well-equipped kitchens, living rooms with satellite TVs and balconies. The tastefully furnished apartments have en-suite bathrooms, double or twin beds, sofa beds, furnished living rooms with telephone connections, satellite television sets, kitchens with all the necessary equipment and utensils, dining tables and chairs. There is a fully equipped kitchen in each apartment for self-service. In the hotel’s surroundings, you will find numerous restaurants and bars offering various local and international delicacies. For cocktails, mojitos and other drinks, there’s a poolside bar. You can also make yourself comfortable in your room by taking advantage of the In-room food and beverage service provided by the hotel. Rubimar Suite ApartHotel has a large outdoor pool lined with sun loungers and parasols. There is also an indoor pool as well, along with a whirlpool. Get yourself pampered in the spa and wellness centre. You can also utilize Jacuzzi, sauna, Turkish hammam. 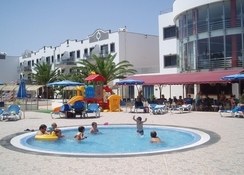 The youngest of the family too have a space designed exclusively for them that include a children’s swimming pool, playground and lots of fun games. Enjoyed everything about this Hotel. Enjoyed everything about this Hotel. It was so relaxing and the food although wasn't a lot of choice was very good and fresh. The photos do not do the hotel justice the hotel is beautiful with everything you need round it. It is in the most beautiful location with the marina just across the road!! Food was great and rooms were huge. Staff were so friendly and helpful. We loved it !! Very basic hotel and grounds. Not much for kids to do, not a big pool. Not a large selection of food and drink on site. Rooms were light, spacious and clean. Excellent location for Rubicon Marina. My boyfriend and I stayed here for 3 nights in Nov 2017. The room was nice and the location was really good. I would say a few improvements are needed: there should be water available at all times. There was no water fountain/tap in the reception area. We were leaving to return home quite early in the morning and my boyfriend had been sick the night before. We couldn't get any water, as it was too early for the bar to be open. I did not think this was right. The food was OK, but could be a bit more varied. We were glad we only had 3 nights there, any longer and we would have got fed up and felt sluggish. The pool area wasn't quite as the pictures showed, we thought there were actual beds around the pool, but these were nowhere to be seen. However we did enjoy the indoor pool, as it was warmer than the outside one. A very reasonably priced holiday right in the thick of things, basic but clean, tidy and fresh cooked food.Staff excellent! !